Favourites old and new will feature in Market Harborough Choral Society’s Celebration for Christmas concert in town this Saturday. The annual show is at Market Harborough Congregational Church’s Jubilee Hall, in Bowden Lane, from 7pm. This year’s concert will feature music from down the ages including Gaudete, made famous in the 70s by Steeleye Span. Other gems will include Slade’s hit Merry Xmas Everybody from 1973 and Last Christmas by Wham. The society’s chairman Steve Pointer said: “We are delighted to present a mix of music to get everyone in the mood for Christmas. The audience will also be invited to join in a number of traditional carols. Tickets cost £12, or £10 for concessions, with under-16s getting in for free. Festive refreshments will be served afterwards. Tickets are available from Spencers estate agents in 49 High Street, Harborough, or by calling Tim Howard-Healy on 01536 763225. Tickets may be available on the door. 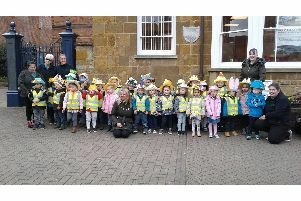 Meanwhile, the society has thanked another Harborough music group for a recent collaboration, and to its supporters for raising funds for charity.